DISCLOSURE: This post may contain affiliated links, if clicked I may receive compensation. Please read my full DISCLOSURE/DISCLAIMER POLICY for more information. Whoa… wait a minute? Summer and Blazers? Yeah, I realize that those two things don’t typically go together. However, Cents of Style has a deal this Monday and they are going to prove why they love their Summer Blazers! Trust me…It’s good. Don’t miss the styling tips below! For Style Steals Monday, June 6th, Cents of Style Summer Blazers are $25.95 & FREE SHIPPING w/code SUMMERBLAZER. 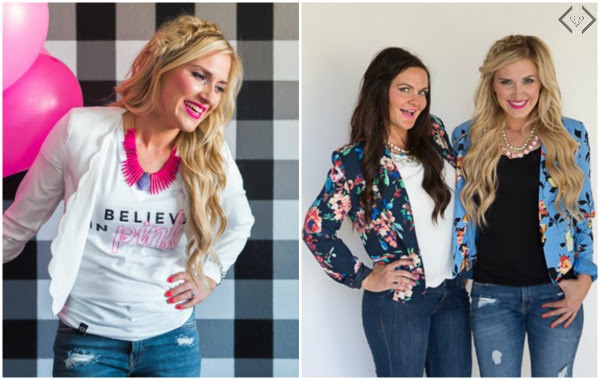 Style Steals 6/6/16 – Summer Blazers for $25.95 + FREE SHIPPING w/code SUMMERBLAZER. Colorful blazer + graphic tee = Summertime perfection. Everyone knows restaurants and movie theatres can run on the chilly side. Wear your favorite graphic tee while you are outside…keep that blazer with you and throw it on with the A/C is a little too intense – it can keep you from freezing, and adds a little structure and style for your night out. We love to throw on our favorite structured blazer with our favorite flowy maxi skirt. It’s perfect for weddings or date night (we love it with a chiffon maxi). It adds a little romance and a pop of style. Everyone needs a floral print blazer It is summer perfection. Add it to everything from a solid top and jeans, to your favorite tank & cut offs. It adds fun patterns and a touch of class. Viola, you are ready for drinks with the girls. Added bonus – don’t forget to pair a floral blazer over your favorite graphic tee. The added pattern is our fav. All-white outfits are a Summer favorite. Adding a blazer to your favorite all-white makes it absolutely pop…and is perfect for all those air-conditioned (read freezing) places your stylish self is headed to this Summer! Additionally, at checkout Cents of Style will be offering this stretch bracelet set, that is available in 3 colors, for $1.99. Why styling tips would you give on wearing Blazers in the Summer? I’d love to hear your tips in the comments below! DISCLOSURE: THIS POST DOES CONTAIN AFFILIATE/REFERRAL LINKS.